For a better overview, group messages with ‘View | arrange | show in groups’. Outlook uses standard headings like ‘Date: Today’ or ‘Date: Wednesday’. That can be overlooked while scrolling through long lists quickly. Open the email folder with the grouped messages and then menu command ‘View | Current view | Customize current view’. Subsequently click ‘Other settings’. In the same dialogue box check ‘Grid lines and group headings’ before shade group headings’. Confi rm the changes in both dialogue boxes with ‘OK’. 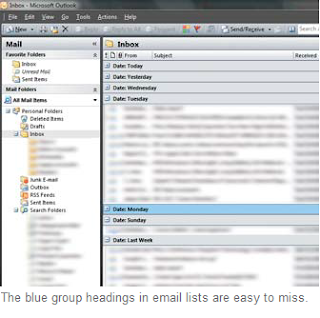 Outlook now highlights the group headings for the complete window width with a bright blue that separates the individual areas clearly from one another. This action aff ects not only the current email folder; it aff ects all folders that the current view uses.